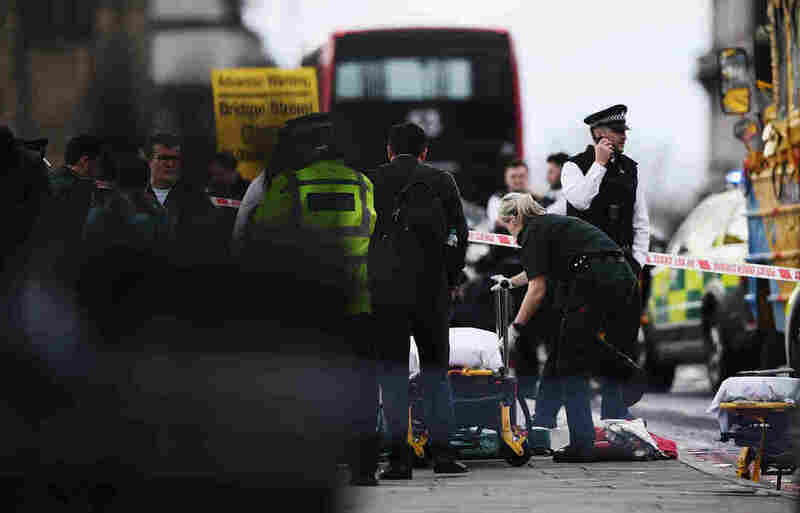 London Attack: Assailant Kills 3, Injures At Least 20, In 'Terror Incident' Near Parliament : The Two-Way Police believe the attacker who killed three people before being shot to death acted alone and was "inspired by international terrorism." Police secure the area close to the Houses of Parliament in London on Wednesday. British authorities have made eight arrests in their investigation into Wednesday's attack in London, police said Thursday morning. Mark Rowley, the national lead for counterterrorism policing, told reporters that there were four dead, including the attacker, and 29 people have been treated in hospitals. Seven people are in critical condition, he said. Police had earlier said there were five dead including the attacker. Overnight, police raided properties, including in London and in the city of Birmingham, which is located in central England to the northwest of London. Rowley said police have searched six addresses in connection with the investigation. "It is still our belief — which continues to be born out by our investigation — that this attacker acted alone yesterday and was inspired by international terrorism," he said, reading from a statement. "To be explicit — at this stage, we have no specific information about further threats to the public." 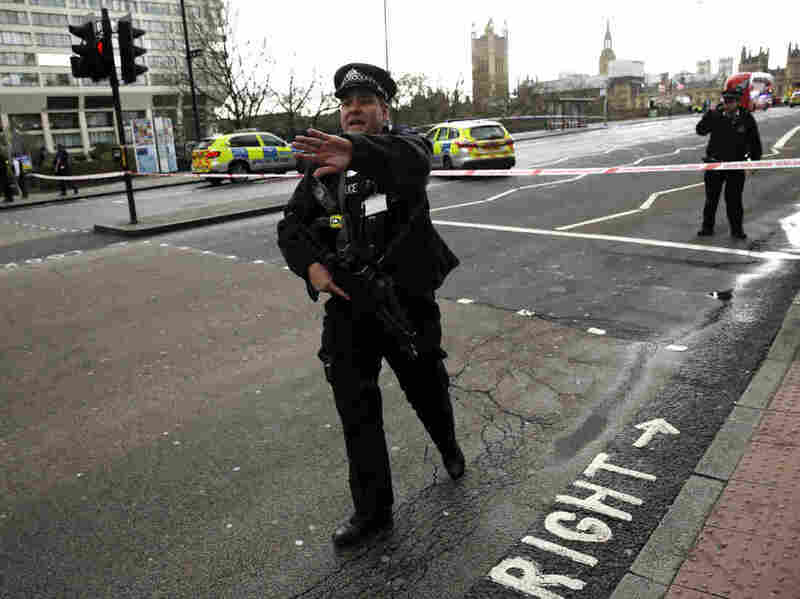 The attack happened midday Wednesday, near the U.K. Parliament building. An assailant killed two civilians and a police officer before being shot to death, British authorities say. Police described it as a terrorist incident Wednesday. Rowley said police believe they know, but aren't ready to release, the name of the man they believe was a single attacker. Rowley requested that journalists refrain from "unnecessary reporting" while investigators check into the suspect's background and any associates. He said police suspect the attack was inspired by Islamist extremism. 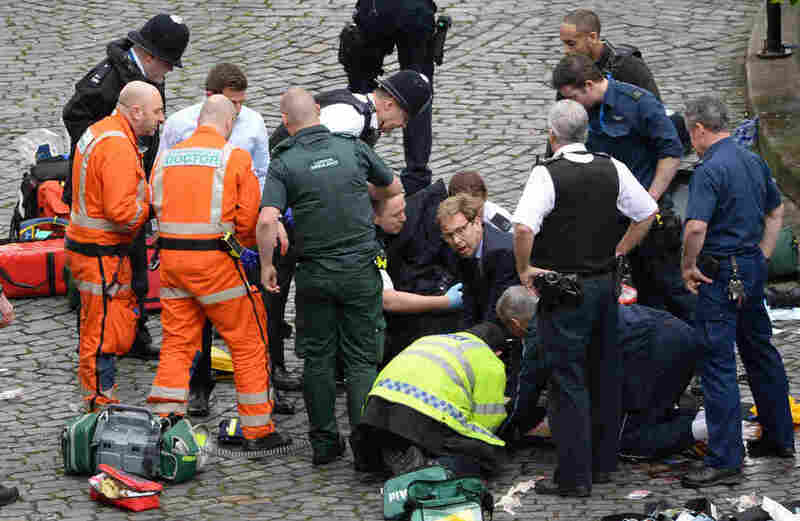 Conservative MP Tobias Ellwood helps emergency services attend to a police officer outside the Palace of Westminster, London, after a policeman was stabbed and his apparent attacker shot by officers in a major incident at the Houses of Parliament. 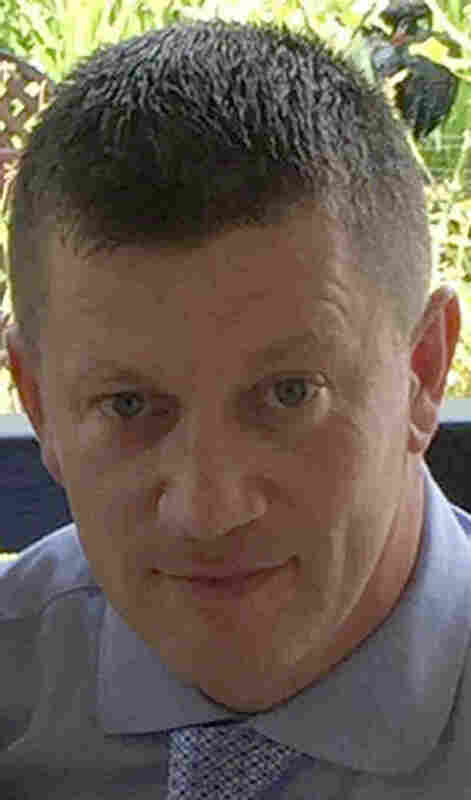 He identified the police officer who was killed as Keith Palmer, 48, an officer for 15 years and a husband and father. Rowley said the public will see more police officers on patrol, especially in crowded places and "iconic locations." Prime Minister Theresa May condemned the attack as "sick and depraved" in remarks on Wednesday evening. Authorities say a small SUV barreled into pedestrians along the sidewalk of Westminster Bridge, causing multiple "catastrophic injuries" to pedestrians. Rowley said he believes this is where the civilian deaths occurred. Three police officers, who happened to be returning from a commendation ceremony, were also injured by the vehicle, he said. Three teenage French students on a school trip to London were also among the wounded, Reuters reports. A woman was found in the Thames after the attack, alive but injured; how she fell in the river is not clear. After striking the pedestrians on the bridge, the SUV then crashed into the fence that surrounds Parliament. A man armed with a knife emerged and stabbed a police officer before being shot to death by police. British law enforcement officers do not typically carry guns, but the Metropolitan Police said on Twitter that armed officers were among the law enforcement personnel "on scene and dealing with the incident." Medical staff near Westminster Bridge on Wednesday in London, while the U.K. House of Commons was under lockdown. The officer who was fatally stabbed was not armed, Rowley said. The British press reports that a member of Parliament was among the people providing first aid to the police officer who was stabbed. Photographs show Foreign Office Minister Tobias Ellwood, his face bloodied, crouched at the heart of a group of emergency responders. Ellwood is a former soldier whose brother died in the 2002 terrorist attack in Bali, The Telegraph reports. "This is the bridge that goes right up to Big Ben — it crosses the Thames. And it appears that a vehicle went across the bridge [and] went down the sidewalk. And we can see from aerial helicopter shots that in fact there are at least four or five people being treated, lying on sidewalk. Then it came across the bridge [and] crashed into a gate; the front end is smashed up. "And then somehow a man ... got actually inside the gates of the Parliament building and apparently stabbed a police officer." House of Commons business was suspended for approximately 15 minutes before Commons Leader David Lidington told members of Parliament about the situation, saying a police officer had been stabbed and the alleged assailant shot by armed police. During the lockdown, members of the House of Commons nearly filled the chamber's famed green benches — moments earlier, the benches sat empty after a sparsely attended debate over pension plan rules. MPs later voted to adjourn Parliament for the remainder of the day. But Parliament says it will return to its normal schedule Thursday. "For this to happen right in the heart of the city is very shocking," Frank added. It's also surprising that an attacker appears to have gotten into the heavily fortified premises of Parliament. The nearby Westminster metro station was closed "due to a police investigation," city authorities said Wednesday, and police asked members of the public to steer clear of the area. White House press secretary Sean Spicer said President Trump spoke with the prime minister. "The victims in this are in our thoughts and our prayers. The city of London and her majesty's government have the full support of the U.S. government in responding to the attack and bringing those to justice who are responsible. A previous version of this story said the officer who was killed was armed. Police official Mark Rowley has said the officer was not armed.